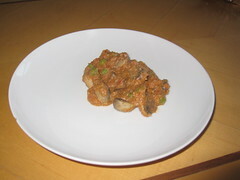 Soak cashewnut in water for half an hour (or) cook cashews in boiling water for 5 minutes. Make it as paste(blender or mixi). Wash peas and boil it in water for 5 minutes. Cook mushroom in boiling water for one minute. Heat oil in a wok,add whole garam masala(bayleaf,cloves,cinnamon). Add onion paste, ginger garlic paste and cashewnut paste. Fry well and keep stirring so that it doesnt stick to pan. Fry till the paste turns to little golden brown colour. It indicates raw onion smell goes off and add tomato paste. Cook till tomata paste is cooked and raw smell goes off. Keep stirring ,add garam masala powder and chilli powder when oil oozes out from the paste.Check the salt. 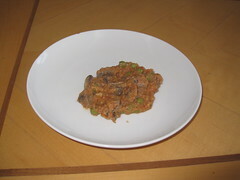 Cook for few minutes and add cooked peas and mushroom. Gravy is ready to serve. Onion and tomato paste will take long time to cook .So just fry onion and tomato and blend it to make paste. This way is easy to make this masala. 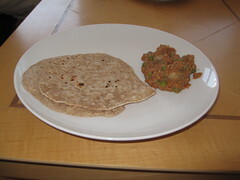 This yummy matar mushroom masala can be served with Rotis,Naan, Rice ,Chapathi and with any kind of bread.